Many of us believe that the LGBT community was largely unknown to the general public until the the the Gay Rights movement of the 1960’s. We didn’t all live in a shadowy and secret world back then; there was a brief and wonderful time when Pansies ruled! Prohibition began on January 1th, 1920, forcing bars and legal venues out of business. The mob saw a great business opportunity and quickly began opening speakeasies, where you could drink illegal booze and watch some of the best entertainers in the city perform. Crooked cops were paid to look the other way and the clubs were run without much interference. This lawless atmosphere attracted an unique mix of customers who came from every class; “slumming” became all the rage with the fashionable set. Jazz was the hottest music craze at that time and so the speakeasies scoured Harlem clubs for talent. Many of the clubs in Harlem began catering to wealthy white customers in search of the latest and greatest performers. The breaking down of racial barriers in the speakeasy scene helped to lead the way for the Pansy Craze. 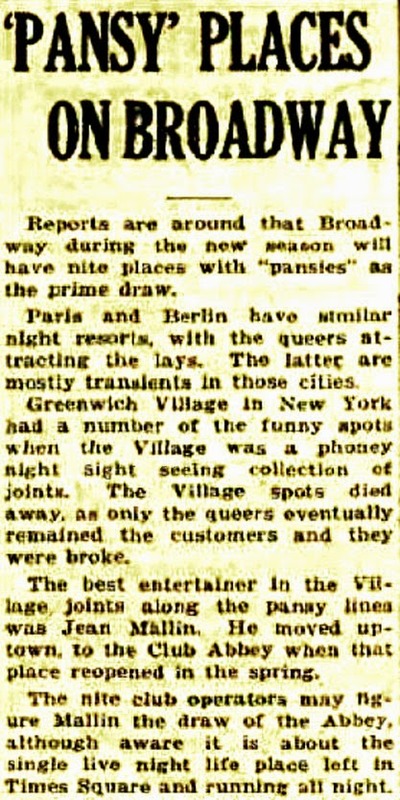 Variety declared in 1930 that New York City was being swept away by the “Panzy Craze.” The upscale Midtown speakeasies now began looking downtown to the Greenwich Village gay scene for something to titillate their audiences. The most talented drag acts and Pansy performers were hired to perform for their mostly straight audiences. These brave entertainers were not only open about their homosexuality, they made it a big part of their stage act. There were too many talented Pansies to mention, so I will focus on the two that I feel were the most important: Gene Malin and Bruz Fletcher. Gene (Jean) Malin was one of the most influential gay performers of his time. He started out as a chorus boy but lost job after job for because he was considered too effeminate. Malin made a name for himself by creating costumes for Manhattan’s drag balls, then as a Zigfield Follies ‘showgirl.” His work as a female impersonator attracted the attention of speakeasies looking for Pansy Acts and he soon was playing bigger and bigger clubs. Jean Malin sings "I'm Spanish"
Malin eventually gave up the drag and began working as an openly gay emcee, something that was pretty radical for that time. He was known for being a great entertainer, a quick wit and someone who demanded respect. Jean Malin with his Hollywood friends. Malin once beat up 4 straight men who threw a pitcher of water on him while he was performing. The six feet tall Malin wasn’t the "Pansy weakling" they had thought they were bullying! The story made all of the papers. 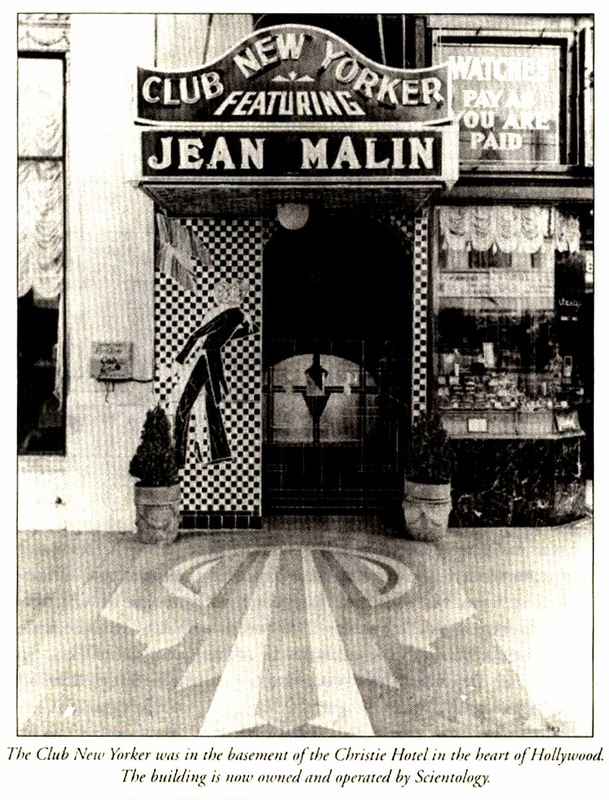 Malin died in a freak automobile accident in 1933 after performing at a club in Venice Beach California. 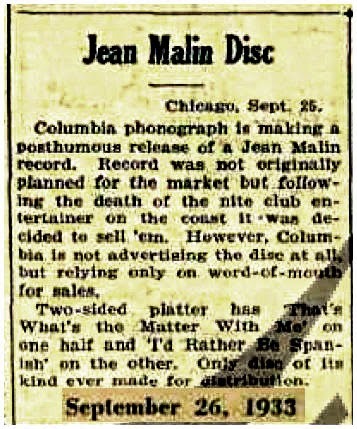 A menu from one of Jean Malin's club appearances in the 1930's. One of the most unique talents come out of the Pansy Craze was Bruz Fletcher. Born to a wealthy and severely dysfunctional midwestern family, Bruz headed out to Hollywood. After years of performing in various clubs, Bruz began headlining at Club Bali . His show was booked for only two weeks, but ended up running for 4 years. His witty and coded gay references rose above the camp making the little watering hole a favorite of the Hollywood scene. Bruz was mentioned over 200 times in the LA Times during his run at Club Bali. Lucky for us Bruz recorded several records; even Ernest Hemingway had a Bruz Fletcher album in his Cuban home. Bruz Fletcher sings "Bring Me a Lei from Hawaii"
After Prohibition ended on December 5th, 1933, police began cracking down on gay clubs and it was no longer safe or profitable to be an out gay performer. Out of work and unable to cope with his bad fortune, Fletcher took his own life at the very young age of 34. His death symbolized the end of the Pansy Craze and the beginning of an era of intolerance that would last until the Black Cat and Stonewall riots of the 1960’s. Do yourself a huge favor and check out Bruz Fletcher's albums, now iTunes. 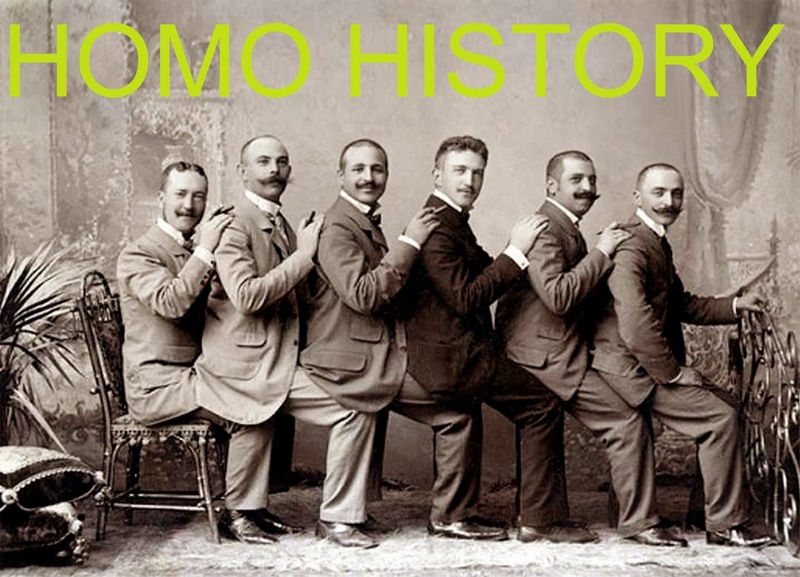 If you enjoyed this Homo History story, please subscribe, it completely free! thank you so much for what you do here it is always nice to some one else also Honoring our history..... And some of the pics are just soo Hott too. Your posts, and the opening of what has been previously been seen by the younger generation as nonexistent (as if being gay or living gay only started with THEM!) is nothing short of revelatory. Than you. Thank you. Thank you. Fantastic information and history. Thank you so much for this and your work. Excellent overview of a much-underreported--and important--link in the rainbow chain. Jean Malin must have been one steel pansy to have risen to the heights he did--keeping in mind that, during his short lifetime, homosexuality was considered not only a jailable offense--but a mental disorder as well. Remarkable he was able to be the figurehead for this brief, fascinating sliver of history--and the fact that Patsy Kelly was in the car he drowned in, when it somehow rolled off The Pier after his final performance there--and she somehow was able to escape to the surface, very nearly drowning, herself--that's a pretty obscure sidebar, too!